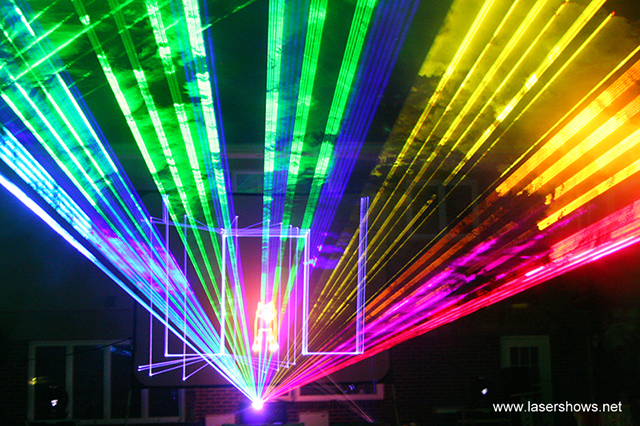 Lightwave deploys over 200 Watts of simultaneous full color lasers to large-scale outdoor festivities, installations, and tours worldwide as the nation celebrates the 4th of July. Rumble in the Basin is a massive Fouth of July party held annually in Worland, Wyoming. The whole town gathers for the event to watch the nation’s largest private fireworks display. The party is a special honorary event for the area’s veterans. 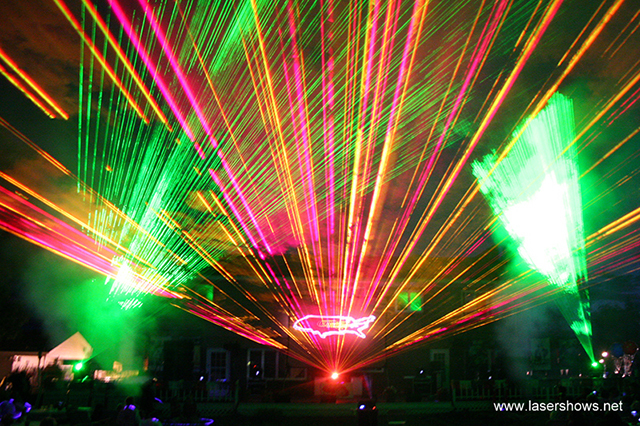 This year, the fireworks display was preceded by a unique patriotic laser light show. It was unlike anything the residents of small-town Worland, Wyoming had ever seen. The event had such an impact that it was featured as the headlining story on the front page of the local Northern Wyoming Daily Newspaper. 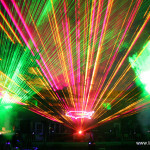 This event is a perfect example of creating a big laser environment in an outdoor setting. 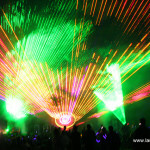 A custom-designed show was played on a large screen, while additional lasers were controlled live and beamed back above the audience of thousands sitting in the backyard field. A massive total of 59W of laser output was used, filling the endless Wyoming sky with beams that traveled for miles beyond where the eye could see. 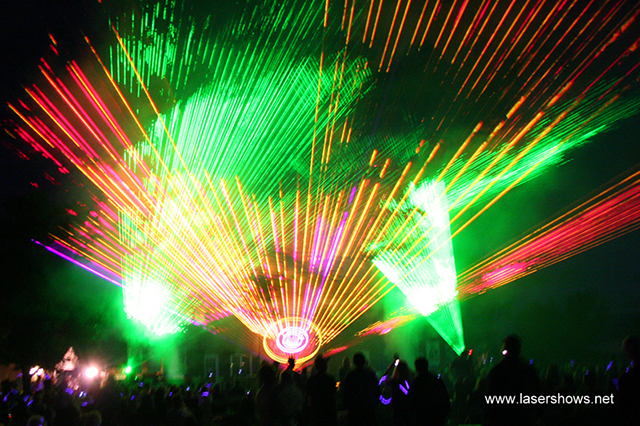 Modesto, CA’s 135th Annual 4th of July Celebration included a laser show in Enslen Park to round out the day’s festivities. The lasers were emitted from a ballfield onto a massive 40’x20′ screen raised four stories high, where the custom choreographed show took place. 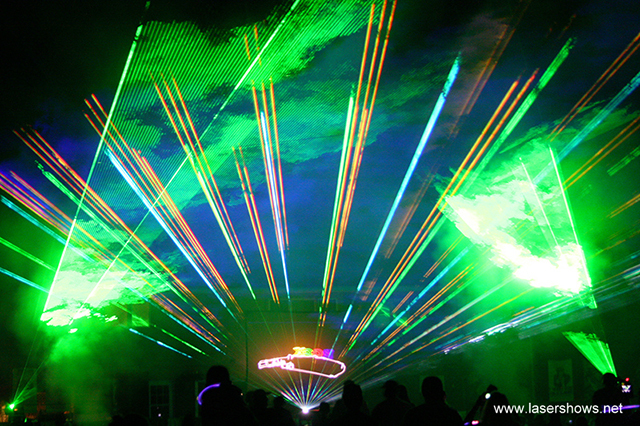 Other beams were aimed back towards the audience for an all-around effect. A total of 32W of output power was used. A second California show took place in Morro Bay, an eco-friendly coastal town. 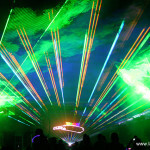 Fog typically oppresses the annual fireworks show, and the controversial decision to instead use lasers was made as a solution to that problem. 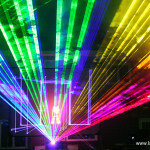 Lasers better satisfy the environmental concerns of the Morro Bay area, and as such, a custom show was performed on a large scrim with extra beams that pointed back at the audience. 32W of output power was also used for this performance. Morro Bay was abnormally clear on the night of the 4th, so tremendous effort was put into creating a foggy atmosphere suitable for lasers.